For the 10th year in a row, I attended DevoxxBe. It’s my favorite Java conference, but the talk schedule isn’t always optimal: sometimes I want to see 2 great talks at the same time! So at the Hackergarten at Devoxx, between attending talks, a few of us started building a webapp to improve the schedule. We’re calling the prototype OptaConf and it’s under Apache License. For the past 4 years, I 've been working in my corner of the world (OptaPlanner, Drools, etc), so my experience on other enterprise Java technologies (JavaEE) is getting a bit stale. Presentations (such as those at Devoxx) keep me in touch with the ever changing Java enterprise world, but nothing beats getting some personal hands-on experience by writing a realistic webapp. I wrote the backend. The frontend was graciously contributed by other Hackergarten attendees: Ixchel, David, Anne Marije, Celestino and Federico. Special thanks to the Hackergarten host Andres for bringing us to together and to other Hackergarten attendees (sometimes the project lead of the specific technology) to help us overcome pitfalls. Plain Java to model the domain classes, such as Speaker, Room, etc. JAXRS to expose a REST service to serve data to the webUI. This was literally as simple as adding a few annotations (@GET, @Path, …​) and a short entry in the web.xml. Brilliant. For more info, see RESTEasy’s documentation. JsonReader to import the talks data from the Devoxx CFP API which is then transformed to our domain classes. I didn’t use JAXRS to read that REST stream, because JsonReader gives me a DOM approach to the data, which I then directly map to our domain classes, without having to model their domain class too (which have no further use to us). Thanks to Arun and the JavaEE 7 samples to point me in the direction of the right tech for the job. For more info, see the OptaPlanner documentation. There are 2 annotations named @Produces and I automatically imported the wrong one. For more info, see Weld’s documentation. WildFly 8 to deploy the webapp. This is so fast, it’s amazing. Startup and deploying our webapp take about 3 seconds. Just make sure a wildfly server is running first: if it’s not, the error message isn’t entirely clear. It uses the JBoss app server plugin, which is only available IntelliJ Enterprise, not in IntelliJ Community. First an annoying pitfall needed to be fixed: the exploded directory needs to end with .war. For more info, see the WildFly website. This hasn’t been implemented yet. Once your session expires (after 30 minutes) your data is currently lost. All in all, this has come together well. In less than 1 day’s work, I was able to implement the entire backend: import the Devoxx, optimize it and expose it as a REST service. Of course, having the experts around to immediately solve pitfalls, helped. I didn’t work on the frontend myself, so it’s hard to comment (but that won’t stop me). We had 3 incarnations. All used AngularJS, some with bower and other stuff. Personally I feel all web ui technologies are clunky: every year there’s a new one being hyped and we should all migrate to that one. Some (Flex for example) went from hype to dead in less than a year. 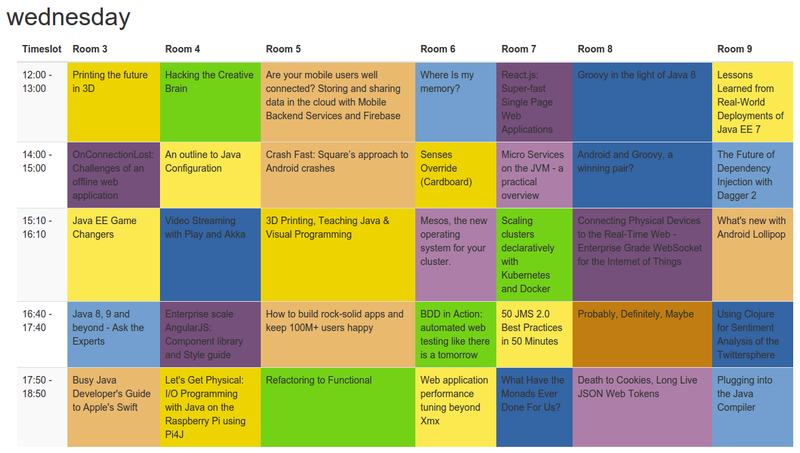 Above is the original Devoxx 2014 schedule for Wednesday. Each track (which are a set of related talks) has it own background color. 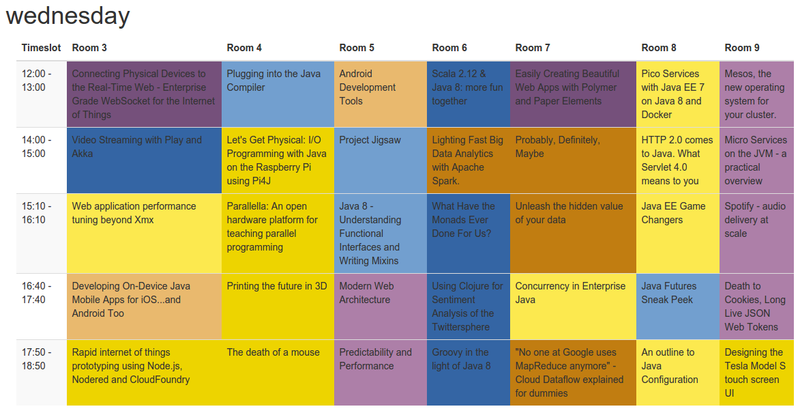 Notice how in the first timeslot, there are 2 Web & HTML5 talks (purple) at the same time. And in the second timeslot, there are 2 Cloud & BigData talks (brown) at the same time. And there are no Methodology talks (green) on Wednesday! That means Methodology talks are almost unavoidable on Thursday…​ oh, the horror! Above is the schedule after it’s optimized with OptaPlanner for Wednesday. Notice how I can now watch all the talks of an entire track without missing a single one. This optimization already takes speaker conflicts into account. On the backend, it has become a lot simpler. JavaEE 7 just works. It’s much simpler than it’s predecessors. Most rough edges are gone. For full disclosure: I work for Red Hat, so I stuck to their implementations whenever there was a choice.